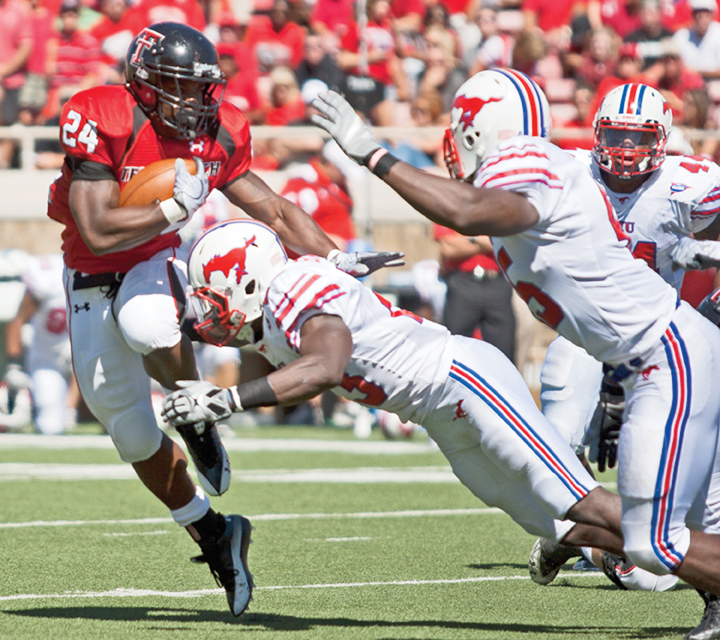 The Mustangs will face the Texas Tech Raiders tonight in a sold-out Ford Stadium. All reserved stadium seats as well as 3,000 general admission lawn passes were claimed, marking the first advance sell-out in stadium’s history. “Everybody is ready to play that’s for sure. Everyone is ready to see a different colored jersey,” SMU head coach June Jones said. Jones enters his sixth season at SMU having only won one season opener, which was against Stephen F. Austin in his second season. SMU also begins their first season as a member of the new American Athletic Conference, which should prove to be a tougher conference than Conference USA, SMU’s previous conference. “We’ve had great effort and concentration in practice and conditioning wise, this is the best conditioned team we’ve ever had,” Jones said. SMU quarterback Garrett Gilbert enters his second season as the starter and the pressure is on the former Texas transfer to improve and take Jones’ offense to the next level. With Gilbert displaying his running ability late in the 2012 season, there are expected to be more designed runs for Gilbert. Jones added assistant coach Hal Mumme this Spring to mix in some of his Air Raid offense that he made famous and is now run by Kliff Kingsbury, the new head coach of Texas Tech. Mumme, the passing game coordinator, has added two-back shotgun formations, a more up-tempo pace to the offense and possibly more formations with a tight end on the field. A key for the offense will be to control the clock and keep the fast-moving Texas Tech offense off the field and that responsibility rests on Traylon Shead’s shoulders. The former Texas Longhorn is expected to have a solid season for SMU and Jones had very high praise for him. “I think the transfer running back Traylon Shead from Texas is maybe the best running back that I’ve had play the position,” Jones said. Returning for the Mustangs on defense, who have just 17 seniors on their roster, are linebackers Randall Joyner and Stephon Sanders, who are expected to produce in a big way for the young SMU front seven. In the secondary, SMU returns a wealth of talented depth and is expected to be the strength of the defense with preseason All-AAC first-team selection Kenneth Acker and senior safety Jay Scott leading the way. Playing against Texas Tech, who loves to air it out, the secondary will have to be at their best, especially if SMU struggles to get a pass rush with an entirely new defensive line. Texas Tech sophomore quarterback Michael Brewer is expected to miss the SMU game with a back injury and that has left Kingsbury having to choose between two true freshmen quarterbacks, Davis Webb and Baker Mayfield. In a nationally televised, high-profile matchup to open their season, with a true freshman at the helm, it will be on the Mustangs to get pressure on Davis or Mayfield to rattle them early. Ultimately, the key for the game will be scoring first for SMU. Over the last two seasons, SMU is 15-0 when scoring first and 0-13 when the opponent scores first. SMU has struggled against Texas Tech over the years, losing 14 straight to the Red Raiders, and are just 16-32 against Texas Tech all time. The last time SMU beat Texas Tech was 1989 and SMU had their most success against Texas Tech from 1981-1986, when SMU won six straight.